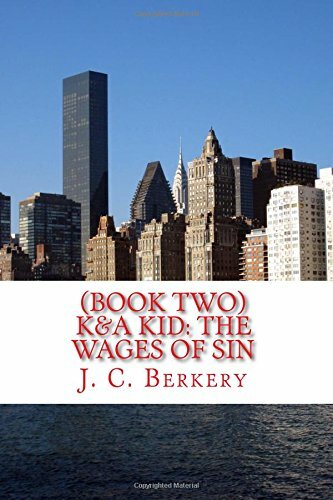 "Book Two: K&A Kid The Wages of Sin" follows the life of Johnny Burke, who has advanced from allegedly leading Philly's Irish Mob a/k/a "The K&A Gang" to become what some authorities have called "Philadelphia's most clever & diabolical criminal" and "the highest ranking non-Italian in the Philadelphia La Cosa Nostra". Burke's close association with Irish and other wiseguys in Boston, London, Dublin, Hollywood & Vegas, along with his friendship with Black entrepreneur and Ali pal, Major Benjamin Coxson, is detailed, as well as adventures in Africa, the Carribean. Eventually most of Burke's friends are assassinated in the Mob War of the '80's in which Burke himself is also the object of a murderous scheme. J.C. Berkery is a second-generation Irish-American, his grandparents having immigrated here from various parts of the Republic of Ireland such as Limerick and Donegal. Berkery's knowledge of, and description of, Philadelphia's nightlife and underworld of the 1960's, up until the present, jumps to life from the front-page headlines of the bloody mob war, beginning with the assassination of Don Angelo Bruno in 1980, providing a panoramic tableau for the kaleidoscopic relationships between such diverse groups as Irish gangsters from the notorious K&A Gang, politicians, South Philly Mafia Dons, Main Line blue bloods, chorus girls, gun molls, crooked cops, and many characters whom even Damon Runyan never dreamed of, including Skinny Razor, the Chicken Man, Tony Bananas, Harry the Hunchback, the Raccoon, Ronnie the Rat, Major Coxson, and Professor Hornswoggle. Berkery holds a Master's degree in English and Publishing from Rosemont College. He lives in suburban Philadelphia with his Dublin-born wife and their two children.